The Children's University rewards young people for the time they spend in out-of-hours learning activities, and provides them with certificates and awards to mark their participation. The programme encourages a culture of achievement and lifelong learning from an early age, increasing motivation and helping to support the transition between primary and secondary education. 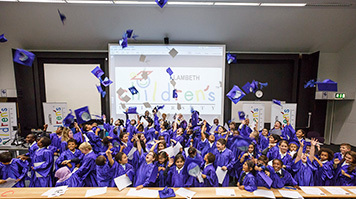 The event saw students aged 7-14, from schools across Lambeth, receive recognition for their achievements. Over the past few months, they have been gathering credits for their learning hours. Those who have successfully completed 30, 65 and 100 hours of extra-curricular activities will be rewarded with Bronze, Silver and Gold Certificates in the formal graduation ceremony, respectively. They were given the opportunity to experience all the academic traditions, including wearing robes and mortarboards, as well as having photographs taken as a permanent reminder of their big day. The young graduates are from Henry Fawcett School, Herbert Morrison School, Wyvil School and Vauxhall School. Former Mayor of Southwark, Lorraine Lauder MBE was guest speaker, who also presented the certificates. The audience was entertained by a trio of violinists and the event was hosted by Professor Rao Bhamidimarri, Executive Dean, and Bev Julien, Pro Vice Chancellor of LSBU and Chancellor of the Children's University. "I'm delighted to continue supporting the Children's University here at LSBU," says Bev. "The enthusiasm and commitment shown by the young participants is inspirational to us all and they are proving that it is possible to "be what you want to be. "We hope the youngsters have enjoyed being part of this great initiative and that it has helped to raise their aspirations. We look forward to welcoming them again to LSBU for further award ceremonies, educational activities or indeed to study here with us in the years to come."